Like cigars themselves, pairing a spirit with a cigar is part science, part art. So while I’m as big a fan as anyone of pairing a fine cigar with scotch, bourbon, or rum, some of the most interesting pairings have been the result of a little more experimenting. In my opinion, beer often doesn’t get a fair shake as a pairing with cigars. Perhaps this is because many Americans think of the watery, unflavorful beers that we see marketed on television, overlooking the many hand-crafted, flavorful beers that are widely available to consumers. 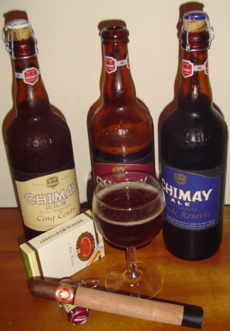 Like Sam Adams and Ommegang Ale, which have been the subject of previous Stogie Spirits articles, the Trappist beers of the Chimay Brewery are flavorful hand-crafted beers with flavors that seem more like fine wines. You won’t find Chimay in an aluminum can; instead, it comes in a 75cl bottle, the same size as a standard wine bottle, capped with a champagne-style cork. Available for $9 a bottle, the Première is a copper-colored, top fermented ale. It features muted fruit and nut flavors with underlying unfinished barley. That wheaty flavor would go well with a creamy mild cigar like a Macanudo Gold or an Ashton Classic. This golden ale is a “tripel” ale, bottled at 8% alcohol at $10 per bottle. Despite its strength, it is a dry, refreshing beer with orange and lemon citrus flavors. The beer is slightly cloudy in color and extraordinarily aromatic. The crisp citrus flavors go well with a peppery cigar like the Don Pepin Garcia Cuban Classic, or with the spicy sweetness of a Cameroon wrapper. This copper brown beer is considered to be the “classic” Chimay ale. It’s also the strongest at 9% alcohol ($11 per 75cl bottle). It has a creamy head with fruit and nut flavors and a slightly bitter taste. Reportedly, it can benefit greatly from cellaring for a few years. With all the fruit and nut flavors, it pairs well with a criollo cigar like the CAO Criollo or the Don Kiki Brown Label.